The State Archives program preserves the records that document the history of Nevada State government dating back to 1851. It has custody over the historical records of the territory and state as defined in state statute, representing the three branches of government: executive, legislative, and judicial. There are more than 17,000 cubic feet of territorial and state government records and over 100,000 images of Nevada people and places, providing visual information that complements the State Archives' documentation of Nevada history. Archival materials are arranged by the name of the creator state agency or office and reflect the mandated statutory responsibilities of that agency. Because no title pages or table of contents exist for archival records, archivists must create finding aids. If you have questions or need assistance, please contact us! For state agencies seeking to transfer records to the State Archives, please complete and submit the Archives Transfer Form. How do I contact the State Archives? Please contact us at 775-684-3310 or Ask-An-Archivist. What kind of materials do you have? 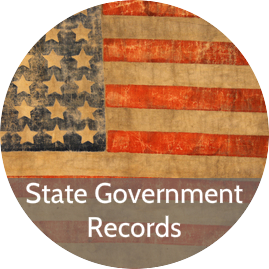 The state archives has noncurrent state government records from Executive branch state agencies, state boards and commissions, territorial, early Ormsby county, Supreme Court case files, and selected Legislative Branch records. Congressional records, private diaries, letters, photographs, and vital records such as birth, death, marriage, and divorce are not in the state archives. Special Collections located at the University of Nevada, Reno and the University of Nevada, Las Vegas have some Congressional records among their many treasures. Check the Nevada Historical Society for materials that are from private individuals which could include diaries, letters, and photographs. Do you have historic mining claims? All mining claims are recorded with the County Recorder. Taxes are assessed by the County Assessor and paid to the County Treasurer. All disputes over mining claims were decided in District Courts, whose records are filed with the County Clerk. The claim may also be described in the tax assessment records, filed with the County Assessor. The State did not keep any records of individual mining claims except where the matter of location or claim was appealed to the Supreme Court. What resources do you have for family history research? Birth, death, marriage, divorce, and mining claims are all filed in the county. Birth and death records were not recorded in Nevada until 1887 when the first vital statistics law was passed by the Nevada State Legislature. The State Archives does not hold birth or death records. Prior to that date, the only possible sources available for proof of birth are newspapers or baptismal records. Inmate Files and Children's Home records are available on a restricted basis. Naturalization records are not filed in the state archives, those are federal records so you will need to check with the National Archives and Records Administration. The Nevada State Office of Vital Statistics also has marriage and divorce records from 1968 to the present. Divorces are civil court actions and from 1862 to the present are kept in the office of the County Clerk for each county. Civil court cases are filed by case number and indexed by plaintiff and defendant. Marriage certificates are filed with the County Recorder in the county where the marriage license was issued, not where the marriage took place. The records of the Northern Nevada Children's Home consist of administrative records: annual reports, financial materials, admittance records, correspondence, newsletters, architectural plans and drawings, Board of Directors' minutes, and photographs; and client files. The client files are arranged alphabetically with an index available. Access to individual client or case files is limited to the clients themselves. The records of the Southern Nevada Children's Home consist of two cubic feet of administrative records and forty-one cubic feet of client case files. The administrative records contain correspondence, reports, architectural plans and reports related to construction of the facility, population reports, sanitation reviews, newsletters, and photographs. All materials containing references to specific children that were not in case files have been discarded. Case files are arranged alphabetically with an index. Librarians and Archivists. Both professionals collect, preserve, and make accessible materials for research, but they differ significantly in the way they arrange, describe, and use the materials in their collections. Materials in archival collections are unique and often irreplaceable, whereas libraries can usually obtain new copies of worn-out or lost books.